The club competes in tournaments in the area and play at a collegiate level. Joseph Kieck remembers walking five miles in the winter to compete in a Pokémon tournament. “[The convention center] was in the middle of nowhere, it was just like farmland all around us. We literally had to walk from the hotel and it was freezing cold the entire time,” Kieck, who graduated from UB last semester with a degree in actuarial science, said. Kieck and other members of UB’s Pokémon club were in Virginia for a tournament and walked in the cold in order to compete. That passion for the Japanese videogame, trading card and television franchise about super-powered monsters is evident in the club’s meetings every Thursday night in Baldy Hall. Club meetings entail members playing both the Pokémon card game and video game. “[The purpose of the club] is to gather an environment of people who share the same interest, which is Pokémon and just find their common passion,” said Gabriel Berrios, a junior economics and education major and president of the club. According to Berrios, several members of the club travel across the nation in order to compete in Pokémon tournaments a few times a year. The winners have their travel expenses paid for and receive a scholarship from the tournaments. Pokémon can function as both a source of income and a way to bring people together through its many mediums. “You can watch the show, play the video game or the card game – that’s what makes Pokémon such a unique franchise: they can reach so many different people through it,” Berrios said. Berrios said not everyone is accepting of playing Pokémon at the collegiate level, even though he says it’s a diverse franchise and has many different levels of involvement. Erika Pierson, a forensic science major at Hilbert College, attends UB’s club meetings because her college doesn’t have a Pokémon club. Pierson has been playing both the card game version of Pokémon as well as the video game since she was a kid, but focuses on the video game for the Nintendo 3DS. That focus has paid off. Pierson is ranked within the top 50 players in the nation for Nintendo 3DS Pokémon game. Being nationally ranked at Pokémon requires more skill than some might expect. Pierson said it takes math skills to be good at the game. The top players calculate what Pierson calls independent values – stat and hit points attack are a few of those categories that have to be calculated in order to win. Some students were hesitant about getting involved with the game, especially since it isn’t luck-based and required some degree of skill. In fact, the Pokémon Club’s current secretary wasn’t even sure whether or not the club was for him when he first joined. 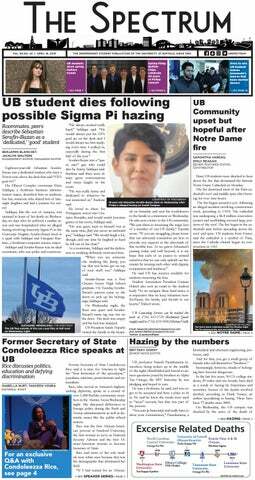 “I showed up to the first meeting and … I had a fight or flight response whether I wanted to keep going or run away,” said Aditya Sidharth, a sophomore biotechnology major and UB Pokémon’s secretary. Sidharth saw the club practicing outside of a Tim Horton’s, approached them and was invited to a club meeting. He showed up but didn’t still didn’t feel totally comfortable. According to Sidharth, the video game hasn’t changed much over the years. The only changes he sees are some improvements in the game mechanics and graphics and the inclusion of more Pokémon. Sidharth believes that more people would be open to the concept of Pokémon if they knew how easy the game is to get back into. “I feel like if people realize it’s not that different from the old stuff, more people would be interested,” said Sidharth. John Jacobs is a features writer and can be reached at john.jacobs@ubspectrum.com.